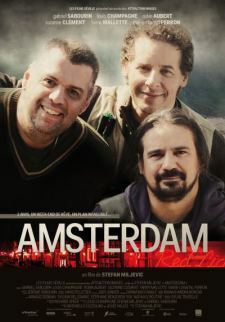 Instead of going on their annual fishing weekend, three friends decide to go to Amsterdam for a weekend of debauchery without telling their wives, but it isn’t until they return home that they commit their worst lies. They enjoy a cocaine-enhanced romp through the red light district, a beer drinking marathon aboard the beer bike, and fishing off a gondola down the canal (at least they won’t be completely lying). All seems well with these three lifelong friends, but the truth is that they are holding back secrets that could destroy their lives. Sam (Robin Aubert) learns that his wife is pregnant right before leaving for Amsterdam, even though he isn’t able to have children. At the end of the weekend, he decides not to return with his friends. He says he needs some time to think about his marriage. The only problem is that his friends Marc (Louis Champagne) and Jeff (Gabriel Sabourin) must figure out what to tell the wives. They decide to say that Sam took off into the woods on their last night, and they can’t find him. The lies quickly get out of hand as Marc’s wife calls the police and they organize a search party, involving the whole community. Sam’s sister (who is also Jeff’s wife) puts all her energy into the search, and Sam’s wife, Madeleine (Suzanne Clément), is distraught as she thinks her news of the pregnancy is what made him take off. The story behind Madeleine’s pregnancy comes out, and as Sam learns the truth, the lives of these three families living in a small sawmill town are changed forever. Marc and Jeff try to hold things together until Sam returns, but when Marc learns the truth, he feels betrayed as well. All three of these actors give moving performances, but Robin Aubert stands out as truly remarkable. Full of intense drama, thrilling suspense and detailed characters, Amsterdam is a highly engaging film about friendship, loyalty, and what can happen when those things are called into question.